Drizzle a few drops of oil into the bottom of a medium to large pot with a tight-fitting lid and slather it around with your fingers (this will help prevent rice from sticking and burning). Then measure out 2 cups of rice and add to the pot (serves 4 people). Add 2 cups good-quality coconut milk, 1 3/4 cups water, 2 heaping tbsp. ​o​f dry shredded coconut, and 1/2 tsp. salt. Stir together and place over medium-high heat. Bring to a gentle (not rolling) boil. When bubbles form on the surface of the coconut water, and you hear the rice softly boiling, reduce heat to medium-low (around 2.5 on an electric stove) or low (if you have a gas stove). Place lid on tight and allow to cook 15 to 20 minutes. After 15-20 minutes, remove the lid. Using a fork or chopsticks, pull rice aside so you can see down to the bottom of the pot. 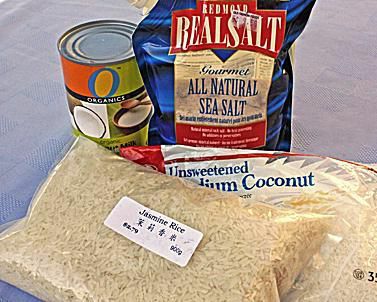 If there is still 1/4-inch or more coconut-water remaining, replace the lid and allow rice to simmer another 5 minutes. Step #6: Allow Rice to Steam. When all or most of the liquid is gone, switch off heat but leave the pot on the burner. Replace lid tightly and allow rice to sit at least 5 more minutes. The internal heat of the pot will continue to 'steam' the rice to create a pleasant, slightly sticky finish. Tip: Let rice sit in this way until you're ready to eat. It will stay hot and moist for up to 1.5 hours - convenient if you're having guests! 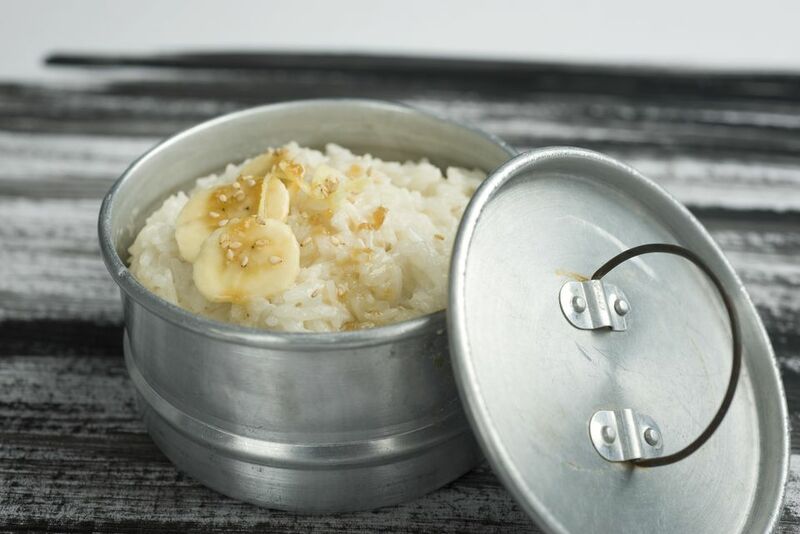 When ready to eat, gently fluff rice with chopsticks or a fork. At the same time, you can taste-test it, adding a little more salt if desired. If you like your coconut rice on the sweet side, add a little sugar. Transfer coconut rice to a serving bowl. It's delicious as is, or top it with a little toasted coconut if desired. See links below for dishes to serve alongside your coconut rice. ENJOY! To Toast Coconut: Simply place 2 tbsp. dry shredded coconut in a frying pan and 'dry fry' it over medium-high heat for a few minutes. Coconut will turn light golden-brown and fragrant. Sprinkle over your rice and enjoy!